There are tons of Facebook genealogy groups devoted to very specific readers. If you search, you can find a group devoted to your area of research: Southern Italian Genealogy, Hesse Germany Genealogy Group, Polish Texan Genealogy, French Canadian Genealogy. You name it! In these groups you will find many people seeking translations of foreign birth, marriage and death records. And there are countless people willing to help. But you can become a self-sufficient translator of your own documents. Often the hardest part is figuring out the letters themselves. It helps tremendously to know the types of words you're looking for. If you learn the genealogical keywords, numbers, months, days, etc., in the language you need, the words will become clearer to you. When you're stuck on a letter or two, search the rest of the document for any other markings that may be the same letter. When you have an educated guess, plug it into Google Translate and see what you get. Don't be intimidated! You just have to know what you're looking for. Here are several excellent resources to help you learn the words you need to know in four languages. If the language you need is not here, visit the FamilySearch Wiki for more. Free book: "A Translation Guide to 19th Century Polish-Language Civil-Registration Documents"
Still getting stuck? Join a specialized Facebook group. You'll find a wealth of knowledge and very helpful genealogists. I spent about five years documenting the thousands of birth, marriage and death records for my grandfather's hometown of Basélice, Benevento, Italy dated 1809–1860. Documenting every record allowed me to bring my grandfather's previously unknown-to-me family back many generations. I worked backwards through time, primarily, so that I could attach people to my bloodline more easily. When I first looked at the earliest reel of microfilm, which begins in April 1809, I was dumbfounded by the very first birth record. My 5th great grandfather, Nicola Pisciotti—age 60—found a baby girl at this door without clothing, as he left his house. The baby girl, whom they named Maria Giuseppa, was a few days old. 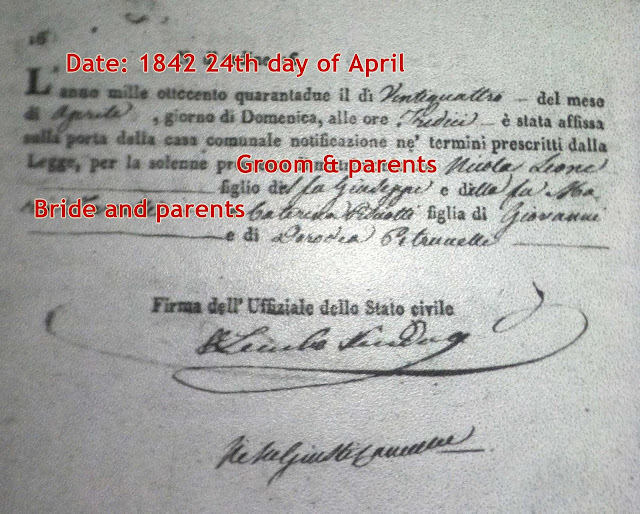 She was 16 years younger than Nicola's youngest son—my 4th great grandfather, Giovanni Pisciotti. 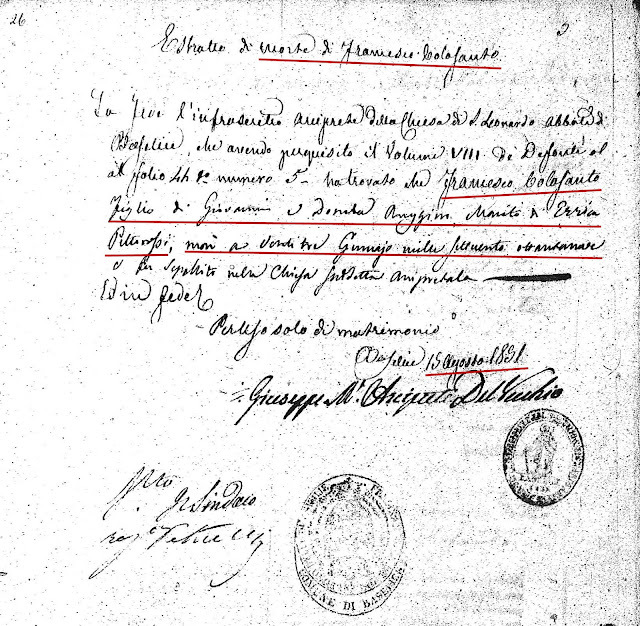 Did Nicola and his 58-year-old wife Rosa Pecora really raise Maria Giuseppa at their advanced age? Well…maybe not. I did not capture an image of this document when I first saw it on microfilm (I didn't have a smartphone yet), but now it is online on the Benevento archives site. And now that I can take my time and translate it, I realize that Nicola found the baby, but he did not raise her. 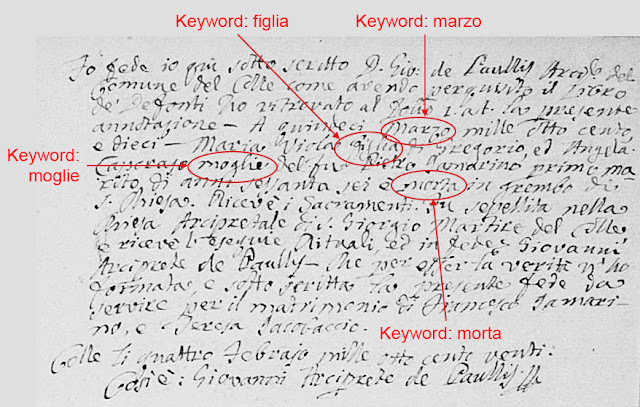 That explains why I found no other records for a Maria Giuseppa Pisciotti. The saddest aspect of these early 1800s records from this small, rural town (population about 2,000) where a young woman absolutely could not raise her out-of-wedlock baby, was that each year about five babies were born to women whose identities were known only to the midwife. The babies were given last names that no one else in town had, and were usually raised at the convent. But not our Maria Giuseppa. Perhaps her mother did not go to the midwife. Perhaps she had the baby on her own, with no help whatsoever, and left the infant at the home of Nicola and Rosa. I don't know what became of Maria Giuseppa because I don't know what last name they gave to her. The last word, nutrice, changed the story entirely. Today, the second day of the month of April of the year 1809 at two p.m. appeared before me, Mayor Pasquale Carusi, Nicola Pisciotti, laborer, 60 years old, living in Baselice on Strada la Costa, and he presented a baby which he says he found on this doorstep, naked, without rags [clothing or blanket], while he was leaving his house. After seeing the baby I [the Mayor] have determined that it is a girl a few days old. I enter the name of the newborn in the registry as Maria Giuseppa. Under that name I order that said child be remitted to a nurse. It wasn't until I translated that last, difficult, handwritten word for nurse that I realized Nicola and Rosa did not raise this baby. Still, it was quite a unique story for this town. So far I've shown you some birth, death and marriage records from the Napoleonic era in Italy. These were somewhat easy to read because they used a fill-in-the-blanks form. But your ancestral hometown may not have used the same form—or any form at all. What then? 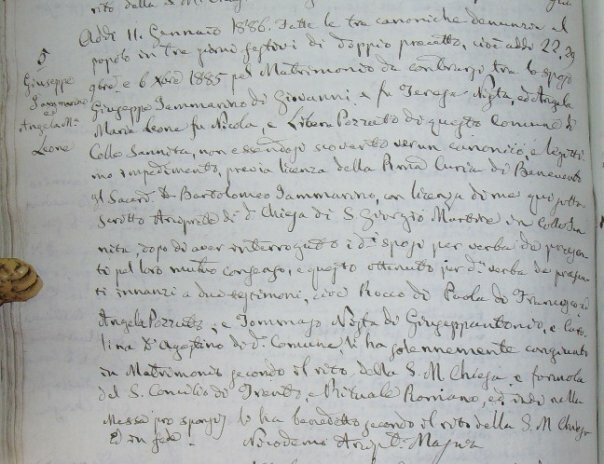 Here is a record of the 1789 death of Francesco Colasanto, written as a single paragraph in 1851. 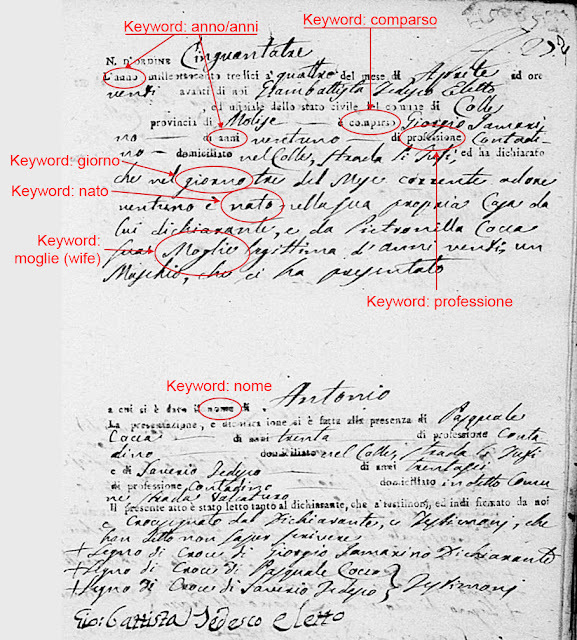 It was part of the 1851 marriage packet of his grandson, Francesco Saverio Colasanto. I have underlined parts of the image and underlined the text that corresponds with those sections to show you how to read this type of document. Granted, the handwriting can be difficult. Practice and exposure to many documents written by the same priest or town official can get you used to reading it. Extract of the death of Francesco Colasanto. 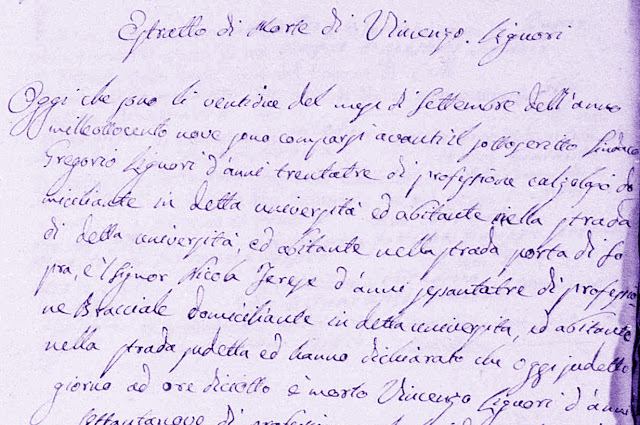 It begins with words to the effect of "In faith the priest of the Church of San Leonardo Abbate of Basélice," and goes on to mention where the original death record is found: Volume VIII, folio 41(? ), document number 5. 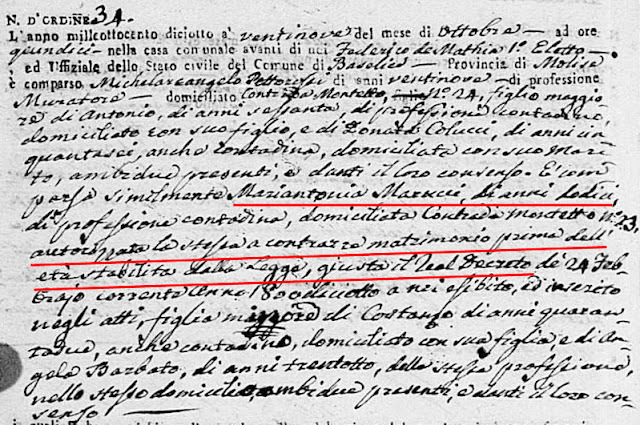 In that book of death records was found Francesco Colasanto, son of Giovanni and Donata Ruggiero, husband of Errica Pettorossi, died at 23 January 1789 and was buried in the same church. It states that this record is being written only for matrimonial purposes on 15 August 1851. 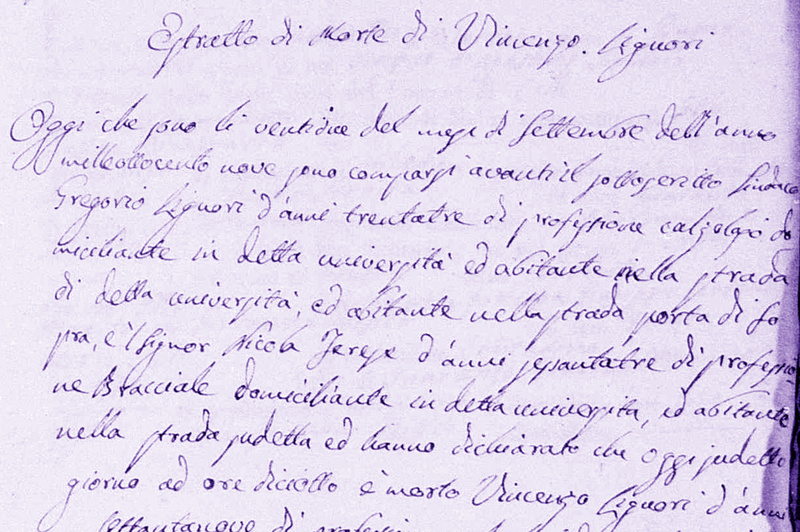 It is signed by the priest, Giuseppe Maria DelVecchio, and by the mayor of the town. It bears a stamp from the church and from the town. After viewing many handwritten documents just like this, I became familiar with their format and was able to quickly pull out the pertinent facts. Don't forget to let Google Translate be your friend. OK. I promise to leave Italy for a while and return to U.S. documents. Writing this blog and explaining my logic is actually teaching me a few things. 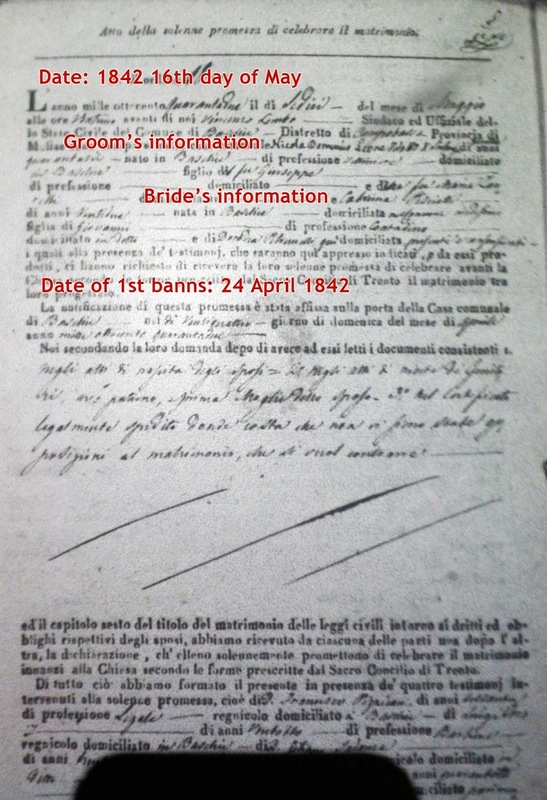 I had something totally wrong about Italian Marriage Records, so this revised blog entry is corrected. 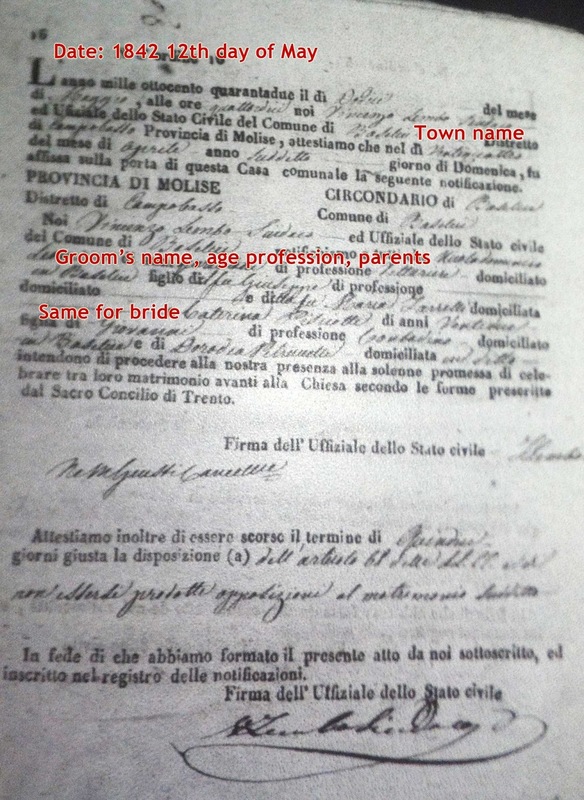 When I was documenting every birth, marriage and death record from the Italian town of Basélice between 1809 and 1860, I was thrilled with the massive amount of information you could glean from marriage documents. In this town there was a whole packet of papers about the wedding itself. But if, say, the groom's father was dead, you would also get his death record. And if his father was also dead, you'd get his death record, which includes the name of his parents. So suddenly you've gone back three generations from the groom. During this period of time a couple had to publicly post a notification of their intent to marry—twice—usually two weeks apart. These two posting dates were recorded by the town. After that an official document gave them the ability to be married. Then the couple was married in the local church. The town would have one record for the first banns, another for the second, another for the finalization, and on the next page a place to record the church wedding date. Then there was a separate document that combined all of this information. 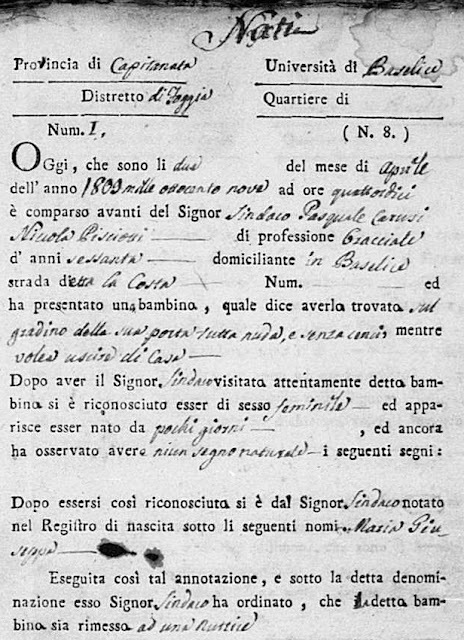 The year 1842 the 24th day of the month of April at 1 p.m. was affixed to the door of the town hall notification of the solemn promise of marriage between Nicola Leone, son of the late Giuseppe and the late Maria Zarrelli, and Caterina Pisciotti, daughter of Giovanni and Dorodea Petruccelli. Signed by the official. The year 1842 the 16th day of the month of May at 9 p.m. … the same name and woman appeared before the same mayor, having twice posted their intention to marry, the second time on the 24th of April. On the back of the previous document was this paragraph stating that the couple was married in the church on the fourth of June 1842. It includes the priest's name. 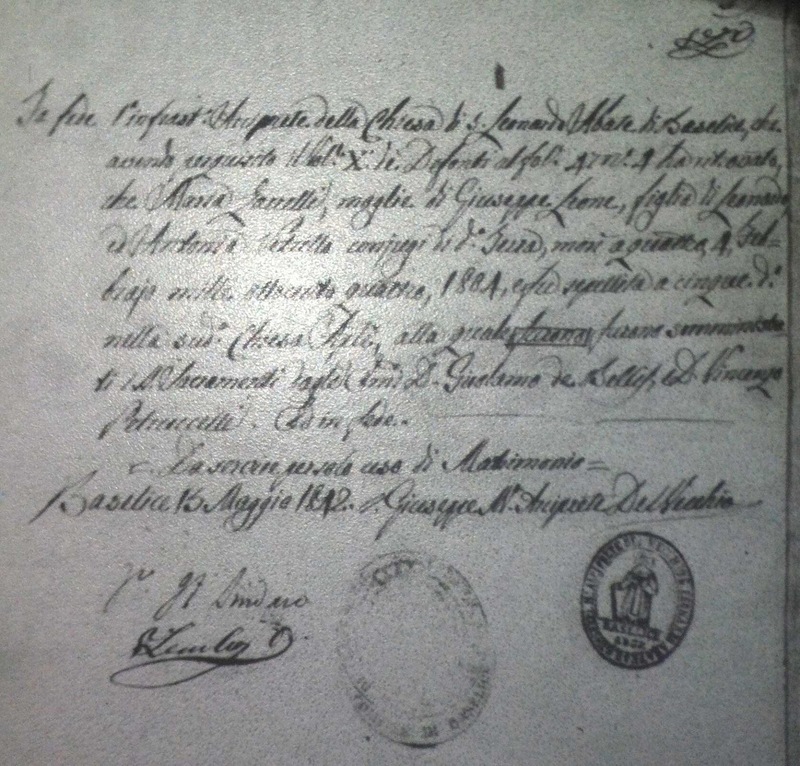 This all-in-one document includes my great great great grandfather Nicola Leone's signature at the bottom. That's a treasure in itself. 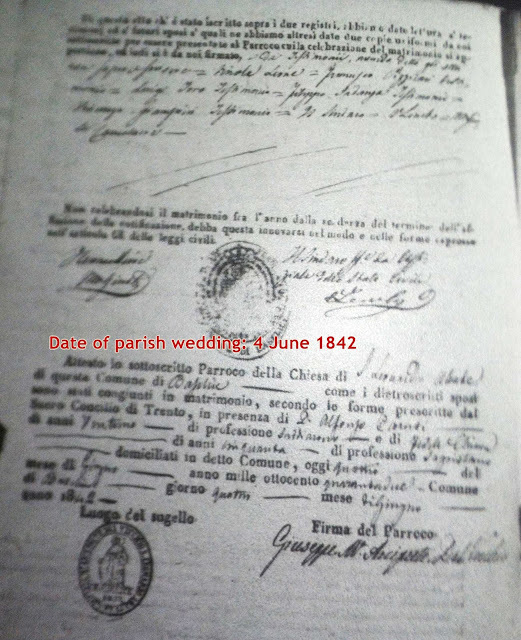 The document includes the dates of the posting of the couple's intentions, their church ceremony date on the right, and again their names, ages, occupations, and their parents' names. In another post I will show some of the other documents in what I call the wedding packets. 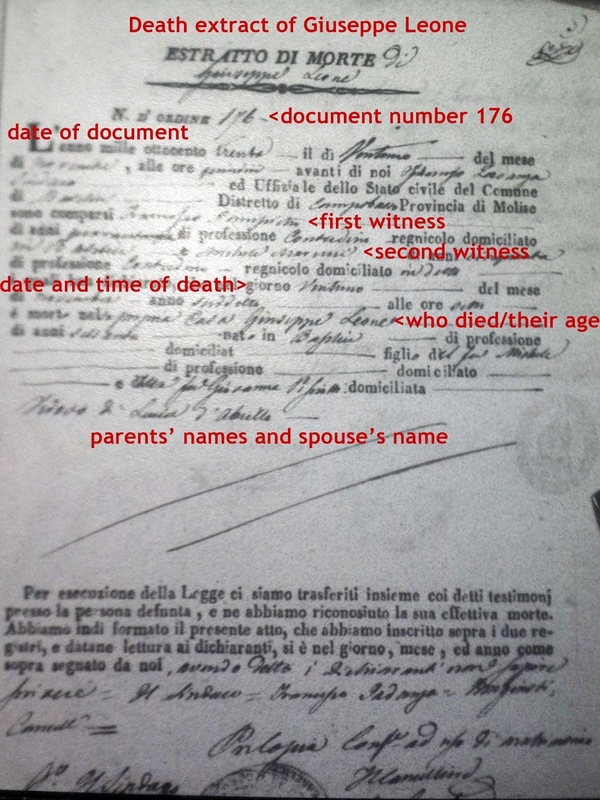 My annotated Italian birth record received a lot of attention on Facebook and LinkedIn, so I'd like to continue with an annotated Italian death record. 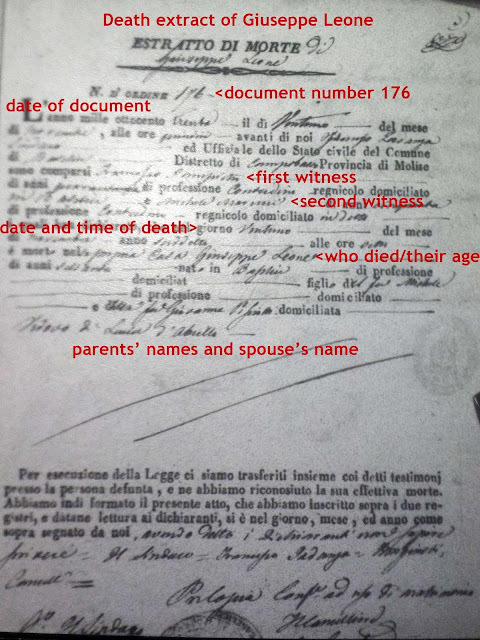 This is the 1830 death record for my great great great grandfather Giuseppe Leone of Basélice, Italy. The general format of many such documents from this era is to state the date, the name and position of the official recording the information, describe two witnesses to the facts, state who died and when, and provide the names of the person's parents and spouse. At the bottom is a somewhat generic official statement that everything above is true and here are our signatures to prove it. Now for more detail. In this particular town the form begins with the words "Death extract" and the decedent's name is handwritten. The documents are numbered in the order in which they are recorded, so this is document 176 for the year. Next is a long fill-in-the-blanks statement reading (in general): "The year 1830 the day 21 of the month of November at the hour 15 (3 p.m.) before me (Mayor's name) and officials of the state of the Comune of Basélice, District of Campobasso, Province of Molise, appeared …"
Next comes the description of the two witnesses: "Francesco Iampietro, age 49, a farmer who lives in this town, and Michele Marucci, age 50, a farmer who lives in this town, to tell me of the death on the day 21 of the month of November in the same year as written above, of Giuseppe Leone, at his own house, age 60, born in Basélice, whose profession was [missing], who was the son of the late Michele and the late Giovanna Pisciotti, and who was the widow of Lucia d'Abrillo." That's a lot of information. At the very least you want to key in on the name of the decedent, when they died, their age and place of birth, and their parents' and spouse's names. In this town's records I have often seen "widow the second time", meaning here is the name of his second wife who also died before him. It is particularly helpful that you can tell by the word "fu" or "furono" that the parents have already died. I have seen several birth records for babies in this town whose father died before they were born. The word "fu" tells me this. Like anything else, with enough practice and a basic knowledge of the key words, you can decipher these documents, too. I spent about five years viewing microfilm of every birth, marriage and death record from my maternal grandfather's hometown in Italy. Gathering every piece of information allowed me to build his very extended family tree back about seven generations. Spoiler alert: 90% of the town was interrelated! It also taught me a lot about how to quickly decipher these documents. Let me show you how. 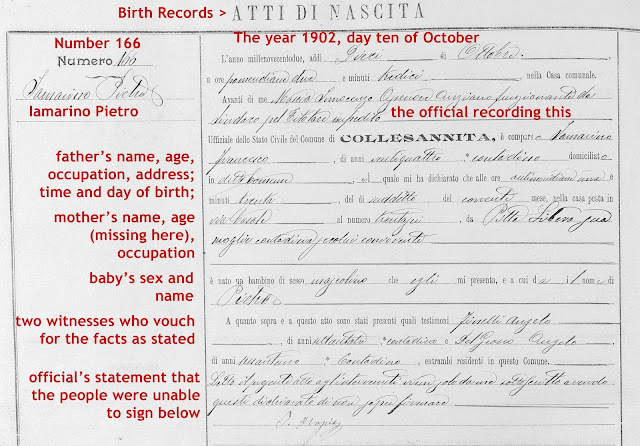 The other day I found online documents from my paternal grandfather's hometown in Italy, and I quickly found the 1902 birth record for my grandfather himself—Pietro Iamarino. Different towns will use a different form, and that form will change over the years, but there are a lot of similarities. They generally begin with the year, day, month, hour and minute of birth. The year is always written out—never in numbers. So 1902 is millenovecentodue. The next section is an official statement to the effect of "Before me, official's name and title in this town, appeared this man (father of the baby's name, age, occupation, and address), to state that a baby was born to him and his lawful wife (her name, age and occupation)." The baby's name is out in the column of the document, but also below the mother's name. The next section includes the names, ages and occupations of two people from the town who swear that this man (the father of the baby) is who he says he is, and that they attest to these facts. After this you may see signatures of the father, the witnesses, and the town official. Often in these old documents the father and the witnesses may be illiterate and unable to sign. If that is the case, the official will state as much. So this document tells me that my grandfather Pietro was born on 10 Oct 1902 in Colle Sannita at 1:30 p.m. to Francesco Iamarino, a 24-year-old farmer, and his wife Libera Pilla. 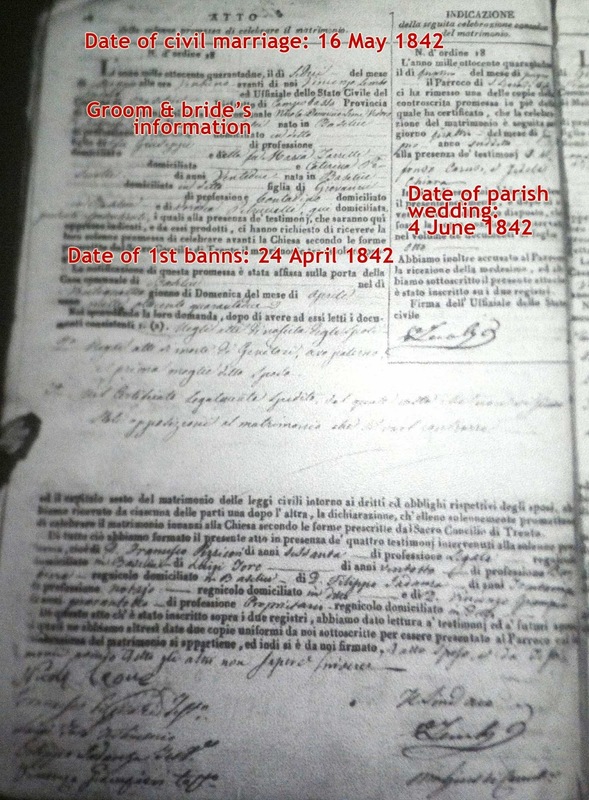 It also says he was born at 36 via Casale, which I'm trying to reconcile with the facts I had previously. I stood on the spot where my grandfather's house once stood, and it was not via Casale, nor can I find a via Casale in modern Colle Sannita. But his father Francesco Iamarino's birth record also includes that address. Once you become used to the form from the town you are researching, you'll be surprised how quickly you can extract all of the facts you need. To learn the key Italian words from these vital records, see my other blog entry, "Italian Words You Must Know."